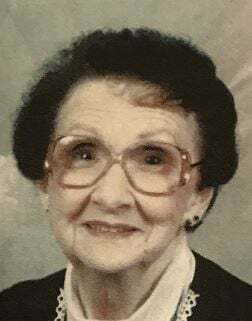 Allean (Pat) Elizabeth Vipperman returned to her Heavenly Father January 6, 2019 at the age of 100. She lived in St. George, Utah. She was born in Lemhi, Idaho, the third child of Mark and Edith Steele. Two sisters, Maxine and Fern and a brother, George, preceded her in death. Her younger sister, Donna Bach, lives in Twin Falls, Idaho. Pat grew up in Hagerman, Idaho. When she was two years old, her father was injured in a mining accident and lost his eyesight. Eventually the family bought some property in Hagerman, where her father learned to farm a small acreage. Pat became his eyes, working with him on the farm while growing up. Her parents were remarkable people, admired by all who knew them for their great example of fortitude, kindness and love to everyone. Pat grew up with those qualities. Pat married Ross Vipperman July 18, 1934 in Hagerman. The couple raised six children, David, Arlene, Bonnie, Sidney, Kenneth, and Sharon. The family eventually moved to The Dalles, Oregon where Ross worked in construction. When all the children were grown and married, the couple traveled to other states where Ross worked. He passed away September 23, 1973. Pat eventually moved back to Hagerman but visited her children many times, bringing joy to all. She was a member of the Church of Jesus Christ of Latter-day Saints and had a testimony of her Heavenly Father and her Savior, Jesus Christ. She dedicated much of her life to serving in the Church and Temple. Her faith has carried her through all the trials of her life. Pat leaves a wonderful legacy with four remaining children, 23 grandchildren, 48 great grandchildren and 109 great great grandchildren. Her zest for life was exhibited by her unconditional love and service for her family and friends, joy in music, singing, dancing, and a unique sense of humor. She was a joy to all who had the privilege of knowing and loving her. At the time of her death, she was living at the home of her son-in-law and daughter, Dale and Bonnie Roley. Funeral services are at 11 a.m. Monday, January 14, at Hagerman LDS Church. Visitation at 10 a.m.